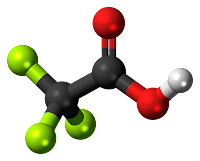 Trifluoroacetic acid (TFA) is a very common additive in reversed phase HPLC mobile phase. It is used extensively as an ion pairing reagent for peptide analysis but also as an acid modifier in a wide range of applications. Generally, TFA provides good peak shapes and reproducible chromatography and is compatible with a range of detectors, being volatile and of low UV absorbance. However, if you are using TFA then there are a few things to be aware of which will ensure that you get the best results. Impurities in TFA may cause noise, high background and spiking in your chromatography. These impurities may come from using low grade reagent or old bottles of TFA. I recommend that a suitable reagent grade is used (preferably HPLC grade) and also, to prevent stability problems, use small bottles so that an opened bottle of TFA is not sitting on your laboratory shelf for a long time. Be careful that a single bottle is opened at a time, especially if there are multiple users. Depending on your requirements, you may find it more convenient to use ampoules of TFA but, as you might expect, these are more costly. TFA is a strong acid; amounts in mobile phase are typically ~ 0.1%v/v or lower. Concentrated TFA is quite dense (1.53 g/mL). This means that the difference between %w/v and %v/v is significant and may be enough to affect your chromatography. Therefore I recommend that you specify the units rather than just write ‘0.1%’ in your analytical procedure.